The Realtors® of the Palm Beaches and Greater Fort Lauderdale (RAPB + GFLR) hosted the South Florida Summit on April 3rd at the Signature Grand in Davie. Over 500 Realtors® across South Florida attended the Summit. Bravo TV’s Million Dollar Listing Star, Josh Flagg headlined the conference and expo as the keynote speaker. He is one of America’s most successful and sought after luxury real estate agents, having completed more than two billion dollars in residential real estate transactions in the past 13 years. An interactive panel featuring some of South Florida’s most lucrative real estate agents spoke on what’s trending in the South Florida market, what to expect in the future, and how they got involved in the luxury home market. Tim Elmes (Panelist) has developed an international reputation as the top luxury real estate agent in Fort Lauderdale with over $1.5 billion in sales. Holly Meyer Lucas (Panelist) is a top producing real estate specialist and nationally recognized industry leader in the Sports and Entertainment real estate space. Billy Nash (Panelist) spent 23 years working with ultra-high-net-worth individuals and properties, including the late H. Wayne Huizenga’s Fort Lauderdale estate offered at $19.9 million. Eric Sain (Moderator) is a Realtor® and district sales manager with Illustrated Properties in Palm Beach, as well as the recently installed 2019 President of Florida Realtors®. The conference included an Expo which featured local industry-related vendors. Realtors® were able to network and discover essential real estate related services. Conference attendees are buzzing from the educational breakout sessions which featured experienced real estate instructors. The speakers included: Bob Swindell, Ariana Pareja, Sev Scaglia, Chris Des Marias, and Ivan Hernandez. The topics highlighted by the speakers were Economic Development in Broward County, Remine, Video Basics, and Transaction Desk. 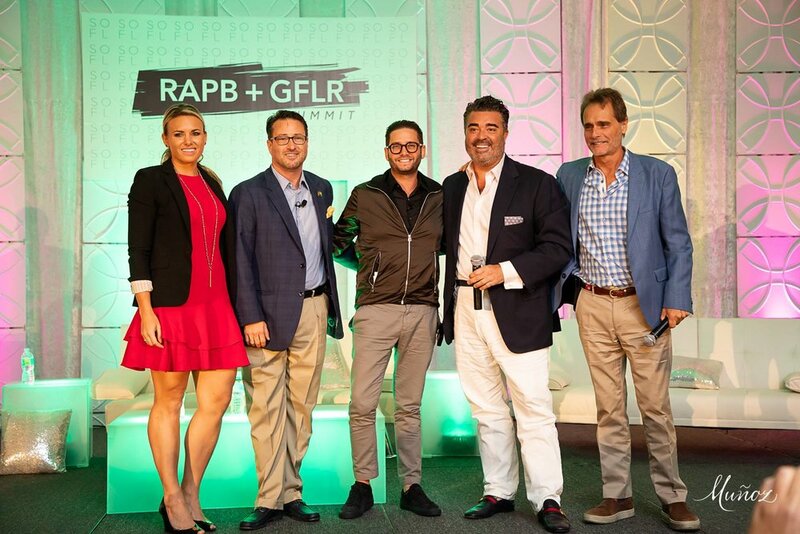 The South Florida Summit was nothing short of an amazing opportunity for attendees to see how beneficial RAPB + GFLR’s services and tools can be to their success in real estate. The event was sponsored by Minto Communities, Botaniko Weston, and Muñoz Photography. For event photos, click here. Realtors® of the Palm Beaches and Greater Fort Lauderdale is the 3rd largest local real estate association in the country. As one unified voice, RAPB + GFLR represents 30,000 Realtors®, 33,000 MLS subscribers, and 5 regional boards across South Florida & the Treasure Coast. For more info, contact communications@rapb.com.